Glutamine Synthetase can be composed of 8, 10, or 12 identical subunits separated into two face-to-face rings. Bacterial GS are dodecamers with 12 active sites between each monomer. Each active site creates a ‘bifunnel’ which is the site of three distinct substrate binding sites: nucleotide, ammonium ion, and amino acid. ATP binds to the top of the bifunnel that opens to the external surface of GS. Glutamate binds at the bottom of the active site. The middle of the bifunnel contains two sites in which divalent cations bind (Mn+2 or Mg+2). One cation binding site is involved in phosphoryl transfer of ATP to glutamate, while the second stabilizes active GS and helps with the binding of glutamate. Class II enzymes (GSII) are found in eukaryotes and in bacteria belonging to the Rhizobiaceae, Frankiaceae, and Streptomycetaceae families (these bacteria have also a class-I GS). GSII are decamer of identical subunits. Plants have two or more isozymes of GSII, one of the isozymes is translocated into the chloroplast. 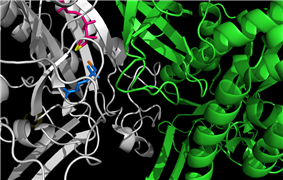 Class III enzymes (GSIII) has, currently, only been found in Bacteroides fragilis and in Butyrivibrio fibrisolvens. It is a double-ringed dodecamer of identical chains. It is much larger (about 700 amino acids) than the GSI (450 to 470 amino acids) or GSII (350 to 420 amino acids) enzymes. While the three classes of GS's are clearly structurally related, the sequence similarities are not so extensive. Reversible Covalent Modification. A tyrosine residue in each subunit in GS can be modified by adenylylation. Adenylyl transferase catalyzes the adenylylation and phosphorolysis reactions. Adenyl transferase activity is influenced by two regulatory proteins: PA and PD. PA reduces GS activity by attaching an AMP unit to GS. Adenylyl transferase and PD removes the AMP unit. PA and PD may be interconverted via uridylyl transferase. Adenylylated GS is less active than unadenylated GS. In the majority of gram-negative bacteria, GS can be modified by adenylylation (some cyanobacteria and green algae or exceptions). Glutamine Synthetase activity influenced by regulatory proteins. ^ a b c ​; Gill HS, Eisenberg D (February 2001). "The crystal structure of phosphinothricin in the active site of glutamine synthetase illuminates the mechanism of enzymatic inhibition". Biochemistry 40 (7): 1903–12. ^ ​; Yamashita MM, Almassy RJ, Janson CA, Cascio D, Eisenberg D (October 1989). 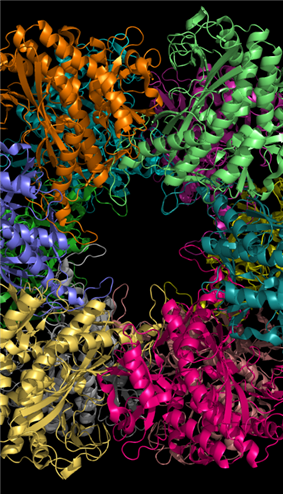 "Refined atomic model of glutamine synthetase at 3.5 A resolution". J. Biol. Chem. 264 (30): 17681–90. ^ Eisenberg D, Almassy RJ, Janson CA, Chapman MS, Suh SW, Cascio D, Smith WW (1987). "Some evolutionary relationships of the primary biological catalysts glutamine synthetase and RuBisCO". Cold Spring Harb. Symp. Quant. Biol. 52: 483–90. ^ a b c d e f g h Liaw SH, Kuo I, Eisenberg D (Nov 1995). "Discovery of the ammonium substrate site on glutamine synthetase, a third cation binding site". Protein Sci. 4 (11): 2358–65. ^ a b c d Liaw SH, Pan C, Eisenberg D (Jun 1993). "Feedback inhibition of fully unadenylylated glutamine synthetase from Salmonella typhimurium by glycine, alanine, and serine". Proc. Natl. Acad. Sci. USA 90 (11): 4996–5000. ^ a b c d e f g h i j k l m n o Eisenberg D, Gill HS, Pfluegl GM, Rotstein SH (Mar 2000). "Structure-function relationships of glutamine synthetases". Biochim Biophys Acta. 1477 (1-2): 122–45. ^ a b c d e f g Liaw SH, Eisenberg D (Jan 1994). "Structural model for the reaction mechanism of glutamine synthetase, based on five crystal structures of enzyme-substrate complexes". Biochemistry 33 (3): 675–81. ^ a b c d e f g h Stryer L, Berg JM, Tymoczko JL (2007). Biochemistry (6th ed.). San Francisco: W.H. Freeman. pp. 679–706. ^ a b c d e Krajewski WW, Collins R, Holmberg-Schiavone L, Jones TA, Karlberg T, Mowbray SL (Jan 2008). "Crystal structures of mammalian glutamine synthetases illustrate substrate-induced conformational changes and provide opportunities for drug and herbicide design". J Mol Biol. 375 (1): 317–28. ^ a b Ginsburg A, Yeh J, Hennig SB, Denton MD (Feb 1970). "Some effects of adenylylation on the biosynthetic properties of the glutamine synthetase from Escherichia coli". Biochemistry 9 (3): 633–49. ^ Hunt JB, Smyrniotis PZ, Ginsburg A, Stadtman ER (Jan 1975). "Metal ion requirement by glutamine synthetase of Escherichia coli in catalysis of gamma-glutamyl transfer". Arch Biochem Biophys. 166 (1): 102–24. ^ a b c d Suarez I, Bodega G, Fernandez B (Aug–Sep 2002). "Glutamine synthetase in brain: effect of ammonia". Neurochem Int. 41 (2-3): 123–42. ^ a b Willard-Mack CL, Koehler RC, Hirata T, et al. (March 1996). "Inhibition of glutamine synthetase reduces ammonia-induced astrocyte swelling in rat". Neuroscience 71 (2): 589–99. ^ Tanigami H, Rebel A, Martin LJ, Chen TY, Brusilow SW, Traystman RJ, Koehler RC (2005). "Effect of glutamine synthetase inhibition on astrocyte swelling and altered astroglial protein expression during hyperammonemia in rats". Neuroscience 131 (2): 437–49. ^ Kumada Y, Benson DR, Hillemann D, Hosted TJ, Rochefort DA, Thompson CJ, Wohlleben W, Tateno Y (April 1993). "Evolution of the glutamine synthetase gene, one of the oldest existing and functioning genes". Proc. Natl. Acad. Sci. U.S.A. 90 (7): 3009–13. ^ Shatters RG, Kahn ML (November 1989). "Glutamine synthetase II in Rhizobium: reexamination of the proposed horizontal transfer of DNA from eukaryotes to prokaryotes". J. Mol. Evol. 29 (5): 422–8. ^ Brown JR, Masuchi Y, Robb FT, Doolittle WF (June 1994). "Evolutionary relationships of bacterial and archaeal glutamine synthetase genes". J. Mol. Evol. 38 (6): 566–76. 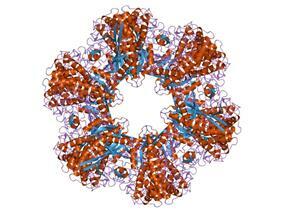 ^ "GSI structure". Retrieved 2009-03-31. ^ van Rooyen JM, Abratt VR, Sewell BT (August 2006). "Three-dimensional structure of a type III glutamine synthetase by single-particle reconstruction". J. Mol. Biol. 361 (4): 796–810. ^ Ivanovsky RN, Khatipov EA (1994). "Evidence of covalent modification of glutamine synthetase in the purple sulfur bacterium". FEMS Microbiology Letters 122 (1–2): 115–119. ^ Krishnan IS, Singhal RK, Dua RD (Apr 1986). "Purification and characterization of glutamine synthetase from Clostridium pasteurianum". Biochemistry 35 (7): 1589–99.